In an interdisciplinary way, the implementation of this VNCE involves concepts from the areas of communication, information system, administration and accounting, involving three research fronts: rethinking the logic of news production, structuring a platform that is collaborative and defining how it should be a management and business model that can give sustainability to this environment. 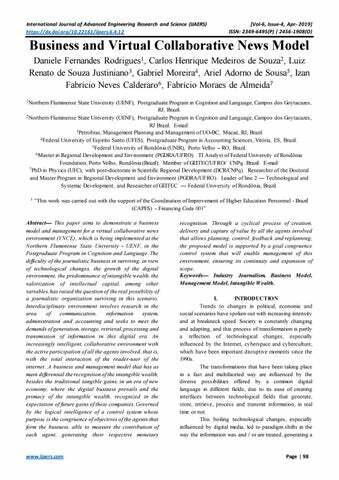 In this paper the objective is to demonstrate how the business and management model should be for a virtual collaborative news environment, since the way of producing information has changed, and the monopolization of the distribution that previously belonged to the journalistic industry no longer belongs, and practically , any individual can produce and distribute information (COSTA, 2014). A new type of collaborative journalism emerges where citizens or groups of citizens actively participate in the process of collecting, reporting, analyzing and disseminating news and information (BOWMAN and WILLIS, 2003) at all times through social networks. In this way, in this new era, wealth is no longer centered solely on physical benefits; but mainly in intellectual capital and intangible assets, which generates the need for a business and management model that considers this intangible wealth in the value creation of the journalistic organizations of this digital era. II. Cyberculture emerged, definitive for the transformations that occurred in the journalistic industry and for the establishment of the concept of "new economy". According to Siqueira and Crispim (2012, page 11), the term "new economy" can also be called the digital economy, internet economy or web economy, where "digital networks and communication infrastructures provide a global platform from the which individuals and organizations interact, communicate, collaborate and gather information. " "New Economy" is the new concept of doing business in the digital age, where the currency is information and the great beneficiary is the customer. Based on the real-time concept of the internet, where distances do not exist and almost everything is a click away, you need to review company-customer relationship policies. According to Tapscott (1997), the technological revolution that the world has been experiencing does not only encompass new internet technologies, since it is an era of network interconnection, but also encompasses human beings, organizations and societies. It is in open and porous environments that the living existence of virtual communities can germinate, as well as the more recent views of the meaning of organizations, which is defined as "organic and dynamic processes in which new elements constantly come into play" ( SANTAELLA, 2010, p.278). IV. THE DIFFERENT RICHES IN THE ORGANIZATIONS OF THE "NEW ECONOMY" In times of New Economy organizations how to measure business wealth, since a portion of wealth is tangible with its quantifiable assets and another great part is intangible as its brands, prestige, reliability and knowledge. It is considered important to analyze wealth in two aspects: Tangible and Intangible. [Vol-6, Issue-4, Apr- 2019] ISSN: 2349-6495(P) | 2456-1908(O) this production with advertising (or what was left of it) and, third, the distribution of the product began to be made through the commercialization of digital signatures (COSTA, 2014, 54). In the new value chain of the digital environment, it is necessary to share distribution and advertising. Costa (2014) still points out that journalistic organizations need to transform themselves into technology companies as well, as the new model breathes in with social networks. For him, the issue is not just being on Facebook or Google, is knowing how to be in each of these networks, in each of the digital platforms, and for this there is technique, that is, you have to modulate for each network; and this is what he calls the superdistribution (COSTA, 2014). V.
International Journal of Advanced Engineering Research and Science (IJAERS) https://dx.doi.org/10.22161/ijaers.6.4.12 important, in view of its purpose, which is to influence the behavior of the members of a formal organization. In a systematized model it is necessary to observe the actions of the people, since it is a system of human activities. To be effective a management model and its control system focused on achieving economic results, it is much more necessary to motivate people to achieve organizational goals than simply to ascertain what is currently occurring. A control system seeks to promote an identity between the goals of the organization's members (individuals as well as groups) and the goals of the organization as a whole. Unfortunately complete congruence is hardly achieved. Thus the goal of the control system is to increase the degree of Goal Congruence (FLAMHOLTZ, 1979). purpose of Goal Congruence, which through Flamholtz's (1979) approach deals with the issue of the influence of systems on the behavior of those involved. In this way, a business and management model for journalistic organizations of the "new economy" needs to use Logical Intelligence of Goal Congruence in defining the roles of all agents involved in the business. Through Flamholtz's (1979) approach to the issue of system influence on stakeholder behavior, Goal Congruence's main purpose is to maximize the likelihood that people will be motivated to achieve organizational goals. It is also considered important that this business model and management use a method of solving problems, which will be adopted here the PDCA cycle, a management tool that promotes the maintenance and continuous improvement of processes, through a circuit of four actions : Plan , Do, Check and Act (CAMPOS, 1992a). The PDCA Cycle can be used to maintain and improve the "control guidelines" of a process, from two perspectives: maintenance (viable and sustainable goals) and improvement (the goals are challenging). Through the PDCA cycle it is possible to control whether the efforts are actually delivering the expected results. Fig. 05 seeks to harmonically demonstrate the main concepts of the business area, considered the most appropriate to create a business model and management that helps in the management of a virtual collaborative news environment. International Journal of Advanced Engineering Research and Science (IJAERS) https://dx.doi.org/10.22161/ijaers.6.4.12 Through the management model, the strategy to be implemented, defined by top management, based on the attributes of scenarios and markets, is established. For the implementation of this strategy and the scope of the competitive advantage, the model is used of the organizational structure, mediated by the actions of planning and control of the Controllership. Controllership, in their measurement models, defines the decision support variables, which aim to guide the convergence of the business objective and its transformation into competitive advantage. VI. Logic of creation, delivery and capture of value by the organization;  Increase in tangible and intangible wealth as value;  Integration and convergence of agent objectives through Goal Congruence;  Management control system through the PDCA cycle;  Establishment of a virtuous cycle;  Growth through a range improvement cycle. When defining a business model, you have to keep in mind that this business needs to create value for someone, deliver that value to someone, and also capture the monetary value to keep it running. This is the logic of Osterwalder and Pigneur (2011) and was used to operationalize the business. In this way, with the first premise, the agents that form this environment, here called Portal de Notícias (reader, publisher, advertiser and the portal itself) were defined, as well as the function performed by each one of them and their relationships, a process of creating, delivering and capturing value. Responsible for generating the reports that will be made available to clients (readers). It will act as responsible for providing advertising spaces for customers (advertisers, large news portals and e-commerces). Responsible for the connectivity of the client (reader) to the portal. Responsible for the receipts of the client (advertiser) regarding the use of advertising space of the portal. Responsible for the customer's (advertiser) receipts regarding the use of Shopping Digital* advertising space and commissions on sales originated in the portal. Responsible for the receipts of customers (large news portals and e-commerces) referring to commissions on sales originated in the portal. Responsible for the use of the Product (reports) which, through the frequency of connectivity, will provide an intangible wealth increase to the business. Responsible for the use of the Digital Shopping product. Great News Portals and E-commerces Source: Rodrigues (2017) Fig. 06 demonstrates the logic of creating, delivering and capturing value, by the agents that form the business and their respective actions, both in the MEIO process and in the tangible wealth consolidator process. From the perspective of the two processes visualized, process middle and end, it is important to describe the logic of value creation by the supplier, delivery of value to the customer and capture of valu e by the business for a better understanding. In the medium process of generation of intangible wealth represented by the multiplication of accesses to the portal, one has the publisher as the agent of creation of value, who realizes the generation of wealth through the elaboration and posting of his reports. The reports will act as attractors of access by readers (clients) who, according to their judgment (enjoy, share and follow) will increase the number of accesses via digital medium, resulting in greater potential for tangible wealth, and consequent appreciation of advertising space. Responsible for the use of the product (advertising space for affiliates) where their products and ancillary services are displayed. At the end process of tangible wealth generation represented by the entry of monetary resources, there is the News Portal providing advertising space in three different ways:  for advertisers who just want to make their ads on the portal;  for advertisers wishing to be part of the Digital Shopping space - having to pay a monthly bond fee (fixed amount), in addition to remunerating the portal with a commission on all sales that they make via portal;  and a third type of use of ad space that will occur when the portal decides to join other larger portals to better optimize its ad slots. Affiliation is a strategy used by many journalistic organizations, especially the beginners, as a way to optimize their spaces not contracted by advertisers, which brings an increase of revenue and, mainly, visibility for the new journalistic enterprise. International Journal of Advanced Engineering Research and Science (IJAERS) https://dx.doi.org/10.22161/ijaers.6.4.12 phases. For the effective completeness of measurements, one has to at least go through the development phases of a prototype and test its effectiveness. Measures to measure the creation of value, both tangible and intangible, associated with news products and advertising space, have become important to the respective acknowledgments that will be given to the agents (publishers, portal as advertising space and digital shopping portal), as a way of providing the convergence movement of the objectives of all the agents involved, according to the third premise. Calculations of estimates of the potentiality of increasing intangible wealth to present value, based on the attractiveness report of the reports, according to the measurement of intangible wealth, previously presented. calculations of tangible wealth increase, based on the billing report for the period, segregated by advertising space for general advertisers and digital mall advertisers. 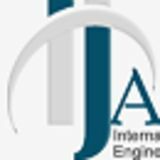 International Journal of Advanced Engineering Research and Science (IJAERS) https://dx.doi.org/10.22161/ijaers.6.4.12 became profitable, and can now be found in many large cities. (OSTERWALDER and PIGNEUR, 2011). Costa (2014) in his report "A business model for digital journalism" presents as an alternative to increase revenues the sale of local advertising, made by the company itself, in addition to the offer of value added services, which would be all services that orbit the business and that the company can afford. The growth strategy to be adopted in the model proposed for the VNCE will be to initiate its activities with the academic community of the partner institutions UENF, UFF and IFF. Being its target audience: publishers (students and teachers of partner institutions), affiliates / advertisers (community of surrounding neighborhoods and commercial establishments of the city of Campos dos Goytacazes with activities of interest to the university public) and reader (students and teachers of partner institutions , community of surrounding neighborhoods and commercial establishments of the city of Campos dos Goytacazes). A first step of growth, which should happen through university connections and academic use, will be the change of coverage for the North and Northwest region of the State of Rio de Janeiro, where its target audience would be: publishers (students and affiliates / advertisers (communities from all cities in the north and northwest of the state of Rio de Janeiro with activities of interest to the university public) and the reader (students and students from different universities in the north and northwest region of the state of Rio de Janeiro) professors from various universities in the north and northwestern region of the state of Rio de Janeiro, as well as communities from all cities in the north and northwest of the state of Rio de Janeiro). From this point on, it is understood that the academic nature is no longer assured and the cycles of growth become less predictable, since they can skip steps of State, Country, Country, Mercosur, South American Continent, American Continent, American continent and Europe, passing through Asia and other continents, reaching worldwide reach. This enlargement can be even greater, due to cyberspace, jumping to global reach, because in this digital age everything is possible, with no physical borders for growth. VII. FINAL CONSIDERATIONS In view of the new scenario in which today's journalistic organizations fall into place, new business and management practices are needed that provide real possibilities for the existence and continuity of these organizations, providing convergence and attendance both to the business objectives and the personal objectives of all the agents involved.